Smartphones have changed how we live our lives. I think it is amazing that in my lifetime so many things have changed, but this is a historical time when smartphones/cell phones have really made a permanent impact on my family. The camera inside alone, sitting in everyone’s pocket allows very little of life’s imperfections to pass by. Now every mistake, every victory, every catastrophe, every violent act, every special moment can be recorded and broadcast out into the world-wide web to be permanently entered in the cyber record. It is “instant”. Since there are so many cameras in so many pockets, and every person can choose where to point it- even the subject matter can be managed by our individual point of view. You are never alone (if you chose to be). “Social” has a much different meaning today. Not only text, but real-time pictures and videos change your perception of how you are connected to humans in your family to around the world in places you’d only read about. You have access to what seems like infinite information. Like I have blogged before the friendly argument on a bar-stool at the local pub has changed forever. Just Google it. Share your opinion, it could be news in an hour. You have access to hundred of thousands of books (probably millions). It is like having the entire library in your pocket. Summon (and pay for it) and you are ready to read things that may have been lost in the back-stacks at your city library. You have entertainment where ever you want it; those long waits in line, those down-times when you are just looking for something to keep your mind going. Movies, music, even art are at your finger tips. There’s a new definition of “getting lost”. It may mean that your Google Maps or navigation application may not be working correctly. Or that your battery has died I suppose. But stop and ask for directions? Hmmm. That is just a start. I couldn’t have imagined as a child that every one would have their own phone numbers, their own built-in answering machine. 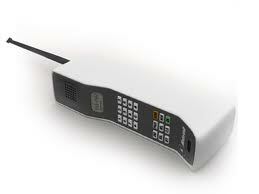 That you could make long distance calls with a phone in your pocket without thinking about the “long distance” charges. That you could conference friends and family together and perhaps even see their expressions – from something that you would be holding in your hand. Virtually anywhere. So I marvel at the idea of where my children will access the world when they are my age. Decades from now there will be something our children cannot fathom, but I wonder what it is? Today, they see the technology advances as a matter-of-fact. It will happen and it will evolve. What will be their marvel?